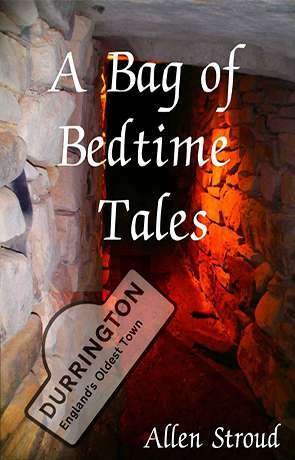 A Bag of Bedtime Tales is an anthology of diverse short stories set in a variety of worlds and genres. The stories are grouped into three sections, one series focuses on the fictional town of Durrington and the strange events that occur there, the next is firmly fantasy genre with stories set in the world of Eledar, and last section is a more eclectic range of pieces titled ‘The Mixed Bag.’ Both the Durrington and Eledar sections relate to other works by the author and as the reader works through the novel you’ll see familiar faces cropping up in the loosely connected narratives. Neither too short nor too long, these stories provide a quick and entertaining read that’s just right before bedtime. The Durrington Tales comprise a number of ‘slice of life’ stories, usually with a hint of the supernatural or strange about them. The stories deal with themes like death, consequences and choice, all expressed in a variety of different and interesting narratives. In a short space Stroud quickly establishes characters and locations with subtle quirks of personality like his lecturer who never needs an alarm clock, and a knack for descriptive language that helps the prose flow. The plots and types of story change radically as you read, a few stories just injecting a bit of strangeness into the world while others are downright sinister. Some of my favourites include Being Dead, a tale dealing with a character’s experiences after his death. The story does a good job of relaying the character’s fears and feelings to the reader, while keeping the narrative interesting despite the lack of action. This thought provoking tale might actually keep you awake at night. Another favourite was Wraiths, Stroud manages to make us really feel sorry for Peter Arnold as the pressures of life and work weigh him down. Side by side with his narrative is another, darker story that pulls the reader in with its mystery and as the reader links them together the climax manages to pull off a last surprise. The rest of the stories in the collection were entertaining too, pieces like Suburban Warrior and Wight showing a darker touch to life in the town along with emotional moments in Talking to Dad. The stories work together to make the reader believe in this unusual place, where as people go about their day to day lives, anything can happen. The Eledar tales keep the ‘slice of life’ tone but with a fantasy base. The stories are more interconnected, and as the reader moves through them they find themselves looking for links like ‘did that potion from the previous story cause that riot?’ A rich world grows more established with every story, and recurring characters give a feel of continuity across the different plots. There are few overt fantasy elements in the section, the most magical tale being The Wizard, the stories instead focus on character driven narratives and follow the same themes as the Durrington Tales. Expect few happy endings as many of the stories deal with hardship and misfortune, with realistic and flawed characters struggling through adversity. Fulvic tells the story of a kitchen boy dragged from his home and into crime by an unscrupulous accomplice, while in The Greatest Theft a former knight tries to come to terms with his past and how to move forward. I think the last tale, Ghoul, is the best of the group. The story slips more into the horror genre, taking place aboard a washed up slaver barge. The atmosphere is very well crafted to evoke a sense of unease and fear that steadily grows as a wayward doctor investigates the seemingly empty ship. There are some great moments of tension and fear in the piece and once the story of the barge is revealed it becomes a genuinely unsettling story. The Mixed Bag, true to its name, has a few stories, a short poem and even a social commentary. The three stand alone stories are very different in content but all written to the same high quality. Both Grave Matters and International Hitman have a tightly focused plot and a snappy twist ending, while Lap Times is more of a slow burn as the reader comes to realise why Lewis isn’t allowed to run. The poem January, is clever, easy to understand and instantly relatable as it gripes about the first month. The last entry, UK Social Unrest, seems out of place in a storybook, while it has some flair to the writing I would question its presence in the book. A Bag of Bedtime Tales delivers what it promises, a collection of original and imaginative stories offering a few pages of escape into another world. Stroud’s prose has style and a professional technique, moving at a good pace and is speckled with touches of humour. The story plots are varied and all offer something unexpected to think on. The book is a bedtime treat. Written on 8th November 2015 by Aaron Miles.